Recessed entrance mats, aluminum gratings, recessed-well mats, below-grade mat systems... they go by many names. It will be difficult to find harder working commercial entrance mats than these! A product once only offered through sales reps and brick and mortar stores is now being offered online at MattingExperts.com. Replacing fillers instead of the entire mat saves money over the life of the mat. Around the time the first version of MattingExperts website was created, owner Rocky Stevens recognized a need in his online retail store for more than carpet-like entrance runners in very busy commercial settings. R. Stevens got to work finding a source that would work with him in the endeavor to bring recessed mats to MattingExperts.com. Samples were sent, phone calls and emails were traded until eventually, Reese Enterprises was chosen to supply MattingExperts.com Corp. customers these mats. What makes recessed mats so popular? First of all, at around $25 per square foot (retail) for their popular Perfec Aluminum and Perfec Rubber hinged entrance mats, they are a great investment. Almost every government and municipal building you enter has one of these systems. Libraries, military housing facilities and jails; just to name a few. All Reese mats carry a 2 year warranty but in truth, these systems stay in service for many years. The filler strips in the mats last on average 5 years before they need to be replaced. The frame surrounding the mat should last until the building is torn down unless there is some circumstance that causes it to be bent. (Transformer visits the building?) When filler strips become worn over time they can be replaced making the mat just like brand new. Replacing fillers instead of the entire commercial entry mat saves money over the life of the mat. Hospital entrances? Airport entryways? Reese makes recessed mats to handle the unique demands of these type entrances as well! Their product called Perfec Grate was developed for heavier loads, more traffic and rolling loads. “The standard load rating for these mats is 300 lbs/wheel rolling load.” (Reese Enterprises BuyLine 3090 brochure.) In addition to carrying such heavy and challenging loads, Perfec Grate can have a recessed area underneath up to 4 1/8” deep. Such a deep recess holds a great amount of debris and water which allows for more time in between cleanings. 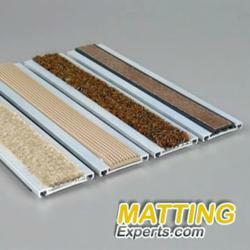 MattingExperts.com has a wealth of informative material including videos and online installation manuals for all the Reese foot grate products. The website also features a request for quote form just for this product to assist in the quote/order process. So stop by the website, take a look and be sure to indicate if any assistance is needed in the purchase of Reese aluminum mat.